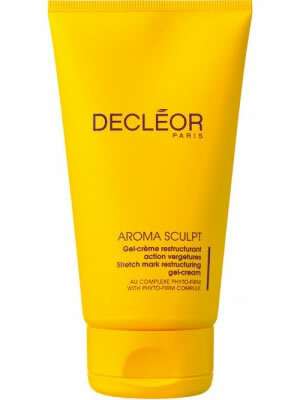 Decleor Perfect Sculpt Stretch Mark Gel-Cream is a targeted, dual-action, anti-stretch mark gel cream. This rich, non-oily formula combines the firming effectiveness of a unique cocktail of eight Essential Oils and the Phyto-Firm Complex, for a visible and proven firming result. A truly comprehensive skincare product that provides complete action to fight the main causes and consequences of loss of body firmness and the appearance of unsightly marks. It visibly lessens the appearance of existing stretch marks and helps prevent new ones. It intensively firms to regenerate skin tissue making it ideal during pregnancy, adolescence and any weight loss/gain periods. All Decleor Sculpt products have undergone in vitro and ex vitro tests on the active ingredients, clinical tests on the boosting effect of Decleor Aromessence Sculpt, and tests on pregnant women under the supervision of a gynecologist (for the Stretch Mark duo).